Unfortunately what she steals has the potential for some terrible consequences. And Kaldar Mar, another thieve, con-artist, gambler – and agent for the Mirror, Adrianglia’s secret service – has been tasked with getting that property back. And he’s going to need Audrey’s help. Of course Kaldar and Audrey do end up together because it is a romance. But what is glorious is that no matter how much they’re hot for each other and no many times they play together, they’re still focused on the actual job. They’re focused on the mission and the conflict – they keep the romance simmering without derailing the actual plot line or giving us the idea that the main plot line is not important. This is a problem I’ve seen before – the whole world is in the balance but hey they still have time to have a quick shag while running away – sometimes it’s frankly bizarre. 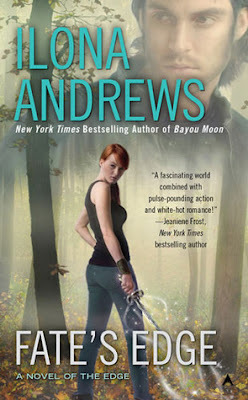 I like the plot – I like that both Audrey and Kaldar are equally invested in seeing this through while, at the same time, it’s not because Kaldar has a job to do and Audrey needs rescuing which is somewhat the pattern of the last 2 books. Audrey can, by the end of the book, definitely walk away, she’s not even motivated particularly by familial loyalty or saving herself or a safe/stable future but by her own sense of responsibility. Even tacking on the kids – George and Jack have their own excellent storylines. They’re so clearly brothers with their endless spats and fights, equally they clearly care deeply for each other. They bring a whole new level of conflict by looking at Jack’s difficulty of fitting in with Weird society while both of them facing considerable class based prejudice for being from the Edge, despite George’s obvious intelligence and capacity. He has to work extra hard at being perfect in order to offset his brother because they are both dismissed as being the same – an excellent comment on how prejudice is often viewed. I also have to criticise the depiction of Alex, Audrey’s addict brother. Look, it makes sense, given her history, that Audrey would not have a kind world to say for this man. But we see him completely separately from Audrey’s viewpoint. We saw his objective behaviour and is completely and utterly terrible. There’s no humanisation of him, no attempt to present him as anything else than an utterly terrible person because of addiction: not even making him pitiable, just a figure of awful. Also the cover - why does Audrey have a sword? That's Cerise's schtick, not her's. Also - that's a creepily youthful face for someone who is described so sexily (especially since the breasts look vaguely like a black blob someone has photoshopped vaguely in the vicinity of her torso). Honestly this looks like a 12 year old has had some breat-y-type-lumps pasted on. I do love this series and these characters – and really am looking forward to this series developing further. But at the same time I kind of want what we have to develop further. I’ll love the next book – but I’ll love it even more if we’re following the world building and the ongoing conflict and meta rather than introducing a fourth couple whose romance and shenanigans we follow. I’m sure that will be an excellent story – but there’s already so many excellent seeds for a story here already we don’t need more hooks. You’ve got four people working for a spy agency with 2 kids apprenticing in and some nice noble intrigue potential from the first book – who needs more than this?! There’s already 6 series worth of books here alone!